In the past, Geographic Information Systems (GIS), which are designed to capture, manage, analyse and present all types of geographically referenced data, were the preserve of large organisations, and typically used for projects such as oil and gas exploration. But now organisations across different sectors are recognising the strategic value of geospatial data, and harnessing it to open up new marketing channels and opportunities for product development. Mapping technology is becoming a cost-effective way to capture, contextualise and analyse geospatial data much faster than wading through complex tables and written reports – crucially allowing them to combine and visualise different sets of data in order to spot patterns and connections that lead to better business decisions. It’s no surprise, then, that the GIS market is set to reach $10.6bn by 2015, according to Global Industry Analysts, Inc. Research carried out for Google by Vanson Bourne amongst businesses in the UK, France and Germany shows that organisations in all sectors are taking advantage of the power of mapping technology to create better relationships with their customers and improve business processes, with over half of those surveyed in each market using it to increase customer satisfaction and achieve a competitive advantage. One of the main reasons businesses are choosing to use mapping technology is to provide more location-related information. This improves customer satisfaction, as well as decision making. Swiss Post, for example, used mapping technology to develop an iPhone app which helps people find post offices, shows which are open late, where bus tickets can be purchased and also allows customers to track the exact location of their consignment at all times. German company Intelligent Apps used mapping technology to develop an innovative taxi-ordering service; myTaxi lets customers track their taxi’s route right up to their pickup location and it also gives a taxi firm’s management team real-time access to information about where its taxis are and how many trips are taking place, enabling detailed evaluation of successful routes and bookings. The cost of each trip is also calculated based on the distances and routes programmed into the maps. Similarly, transport and logistics organisation DHL’s couriers’ GPS coordinates are integrated into maps and displayed on plasma screens in its service centres. Head office uses this mapping technology to capture data about journeys, analyse them, and train the dispatchers on how to make further efficiencies. It has also enhanced customer service by enabling customers to track couriers’ locations online. One UK retailer, surveyed as part of the Vanson Bourne research, said that as customers could view detailed information regarding the status and whereabouts of their orders, calls to their main call centre had been reduced by 15 percent. Increasing customer satisfaction often leads to more web traffic and sales. Nearly half (46 percent) of businesses surveyed in France experienced more visitors to their website since they introduced mapping technology and 38 percent of UK organisations surveyed said it had increased their sales. 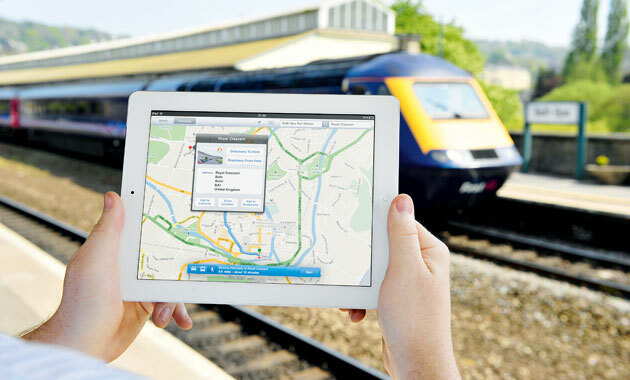 Businesses are also starting to recognise and benefit from the strategic insight that mapping technology can offer. 52 percent of businesses surveyed in the UK said that using it had made them reconsider their organisation or product strategy – rising to 56 percent in Germany and 61 percent in France. Retailers are using it to visualise the time flow of orders and analyse trends such as product selection and where valuable customers are based. It is already providing insight for marketing teams, with 90 percent of marketing professionals in the UK stating that they are using, or have plans to use, mapping and geospatial technology as part of their marketing strategy, and nearly half in France (48 percent) and Germany (42 percent). The UK’s number one property web site, Rightmove, is using mapping technology to track trends. It developed an innovative tool called Draw-a-Search, which allows people to draw their own area boundaries when searching for a property, which they can then save and edit at a later date. This means a better user experience for house hunters, but it can also identify local and national house market trends by analysing the way that people search. Another organisation successfully making use of mapping technology is the Net-A-Porter Group. The premier online luxury fashion retailer has integrated a fully interactive Google Map into its website. Known as Net-A-Porter Live, the service displays a shopping bag icon on a map wherever a product is added to a customer’s wish list or their basket. This geographical visualisation of the products customers are looking at has created an innovative way to discover the latest trends and styles from across the world. As an industry, transport and logistics is pioneering the adoption of mapping technologies, with nearly two thirds (63 percent) of companies in this sector in the UK and 60 percent in Germany already using tools to present and analyse geographic information. The public sector is also embracing them to provide transparency and communicate more effectively with the general public. Retailers, however, have been slow to adopt the technology, with less than half across all markets currently using it, despite it bringing benefits such as improved customer engagement and efficiency for those that are using it. The world’s information is growing at an exponential rate. At the same time, we live in an increasingly visual age and people expect to be able to digest information quickly rather than spending time trying to decipher it. Mapping technologies help organisations uncover new business opportunities and solve problems by presenting data in a way that is easily shared and compared, and quickly understood. Looking to the future, organisations that have the competitive edge will be those that can manage and analyse data quickly and make it relevant for their customers and their business – whether they use it to change internal processes, develop new products or create greater efficiencies. Against this backdrop, mapping technology can only grow in influence and start to play a mainstream role in business strategy.